A developer says rising construction costs and infrastructure requirements have forced it to cancel a $35-million commercial project in Sidney. Omicron Development Inc. announced Tuesday that the Sidney Crossing project will not go forward. 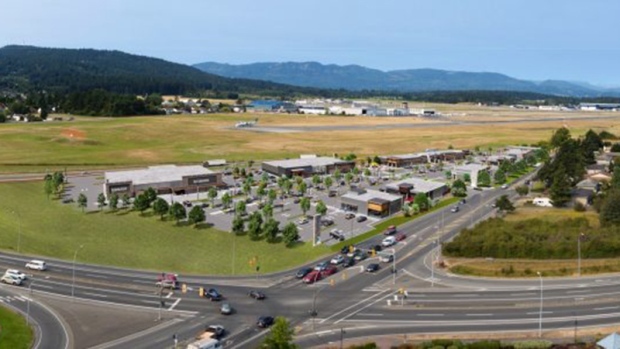 The 100,000-square-foot commercial retail centre, comprising 10 commercial buildings, would have been located on a 10-acre piece of land near Victoria International Airport. In a news release, Omicron says the "unfortunate" decision is the result of skyrocketing construction costs and significant infrastructure requirements that were required to rezone the land, including a pedestrian overpass. Combined with a delayed approval process, CEO Bill Tucker said it was too much for the developer to overcome. "The approvals necessary for this project regrettably took longer than any of us anticipated, resulting in a significant escalation of development costs," said Tucker. "Standing down on this project is very disappointing and an extremely difficult decision for our firm. We pride ourselves on building quality projects in communities and we won’t compromise our professional standards or the community by looking for ways to deliver less in order to address the impacts of escalating costs." He said the outcome isn't something anyone foresaw after Sidney and the Victoria Airport Authority spent significant time on ensuring the project met expectations.